Are labor unions merely an example of "free association"? Perhaps in some dreamland, but the real history of American labor organizing tells a different story. This 1961 book by labor economist Sylvester Petro tells a story of the destruction of private property and freedom at the hands of unions. 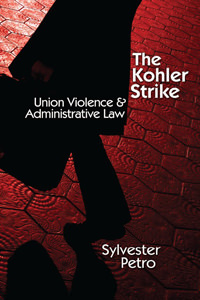 The 1954 strike against Kohler was perhaps the most momentous in postwar history. The laborers who did not want to join were protected by a new law that said that they could keep working. But in fact the labor union used every tactic to prevent these "scabs" from exercising their rights — and the unions worked closely with the government in this respect. As the author writes, "During its dispute with the Kohler Company, the United Automobile Workers Union engaged in sustained violence which covered almost the whole range of illegality, stopping just short of murder. It violated the laws of all levels of government." It is a striking case, and defining case, of how union thugs work with government thugs to destroy free enterprise. Petro tells the story with scientific precision as to detail but also with great rhetorical power. This is a classic book in the history of labor economics. Anyone who is naïve about the reality of unions would do well to master its details. What is most notable here is how Petro's account is completely opposite from the conventional wisdom you hear about this strike. It is usually cited as a case of a corporate monster crushing labor. Read this book and know the truth.